or mix up your own batter mix (we can supply a vanilla batter mix, just add water and eggs). Switch and set the temperature as desired (normally about 250c), wait for the green light, then pour some of the batter (80 fluid ozs) over and almost covering the bottom plates, close the lid, wait for 5 minutes or there about (the green light should go out when cooked), done to a turn! 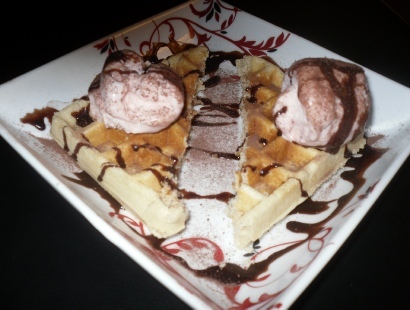 Serve with the toppings of your choice; ice cream, chocolate sauce, cream, whipped cream, honey, pecan syrup, golden syrup, maple syrup, lemon, sugar, chocolate dusting powder, cinnamon, nutmeg, almonds, marshmallows. Sauces; raspberry, strawberry, chocolate, caramel. Fresh fruit; apples, bananas, black cherries, strawberries or your own special toppings. 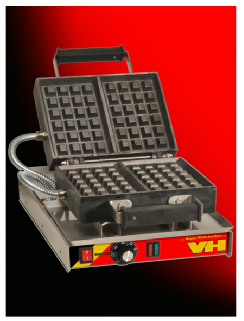 Waffle Machine Hire; Adjustable thermostat with operating lights. 240 volts, 1020 watts, 4.5 amps. Cooking area (2 plates; 10cm x 12cm ). 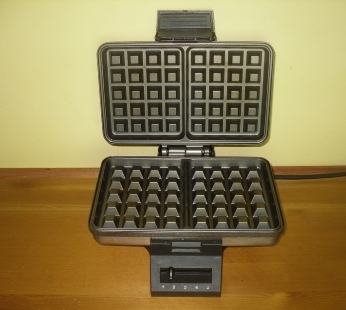 WAFFLE IRON (Professional) 560mm x 300mm x 130mm) 240 volts. 1300 watts. 5.2 amps. 15kg. Heavy Duty non stick cast iron Waffle plates (2 cooking plates of 200mm x 150mm). Cooking area (90mm x 150mm). Alexandra Palace, Business Design Centre, Bournemouth International Centre, Donington Exhibition Centre, Donington Park, Earls Court, Epsom Downs Racecourse, ExCeL, G-Mex Centre, Hilton Brighton Metropole Hotel, Manchester Central Convention Complex, Novotel London West, National Exhibition Centre, Old Billingsgate, Olympia, Queen Elizabeth II Conference Centre, Ricoh Arena, The Royal Armouries Museum, Sandown Park Exhibition and Conference Centre, Stoneleigh Park, Telford International Centre, The O2 Arena, The Brighton Centre, Cardiff International Arena, Theatre Royal Drury Lane, Drapers Hall.